Combine avocado, rice vinegar, lime juice, sour cream, cilantro, salt and pepper in a food processor. Blend until smooth. Add the slaw mixture and Marukan Seasoned Gourmet Rice Vinegar in a medium sized bowl and mix together. Season shrimp with cumin and chili powder in a large bowl. Heat a large greased skillet over medium-high heat. Then add the shrimp and cook until pink, about 5 minutes. 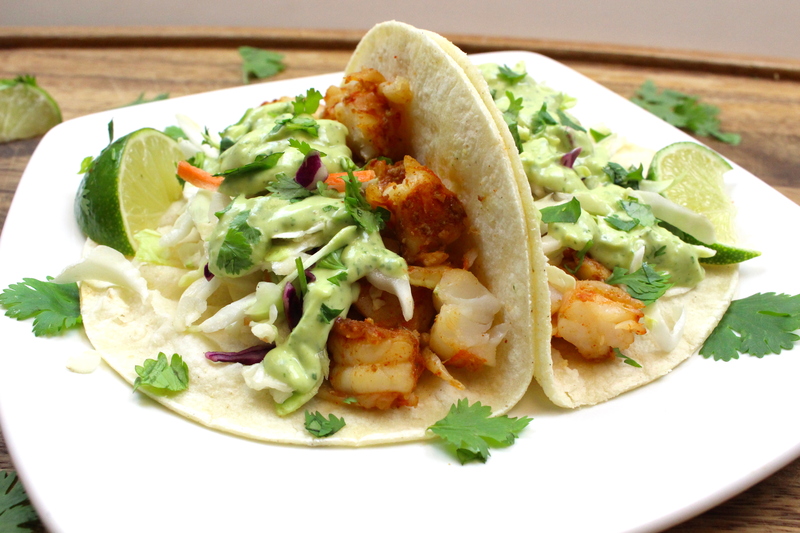 Place desired amount of shrimp, slaw and avocado crema on each taco. Garnish with cilantro and add a squeeze of fresh lime to taste.